can you tell i have babies on the brain. mom, you can let go of the panic and start breathing again. that was not some sort of hint. trust me. one goal i had this year was to learn more about silk screening. well i did just that. and i realized i don't have the space right now to even start going there. 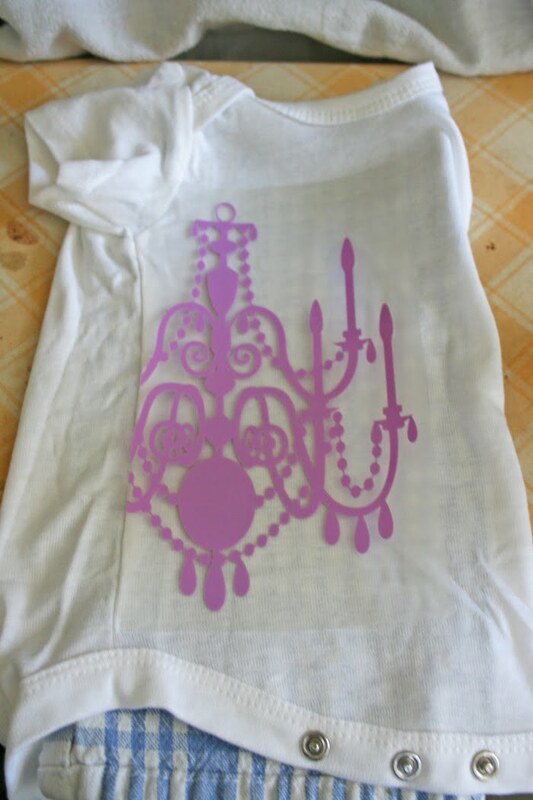 so i came across another alternative (for shirts and pillows at least) and that is heat press vinyl. don't know if you know too much about it but it's pretty cool. 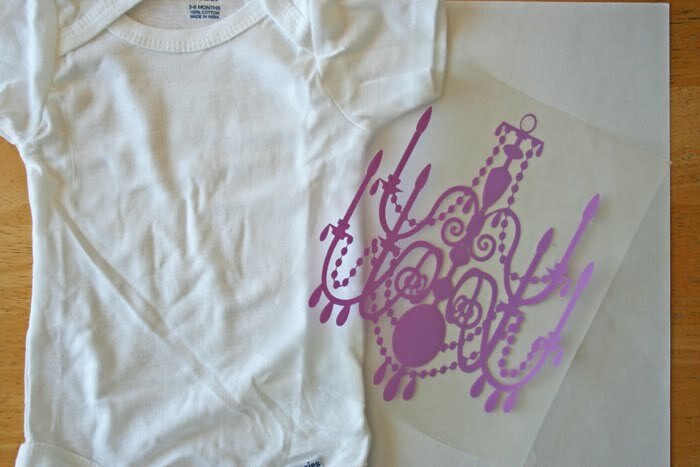 basically you can heat press the design onto you shirt and it melts onto the shirt and becomes permanent. you walk away with a product that feels like a professionally store bought shirt. *shirt you are going to put your design on. *2 thin rags you can iron on. and place the design where you would like it located on your shirt. your first rag should be placed inside the shirt. second rag should be on top of your heat press design. now you are going to place your hot iron (moving it around on top of your rag and vinyl) for about a minute. 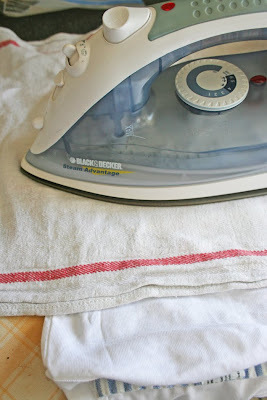 (you don't want it to burn the fabric so make sure you keep the iron moving around on top of it. wait for the vinyl to cool off completely. and slowly pull off the top plastic. should come off fairly easily. if it does not, repeat your steps. then you will need to follow the same steps as before. so simple and so easy but oh so cute. 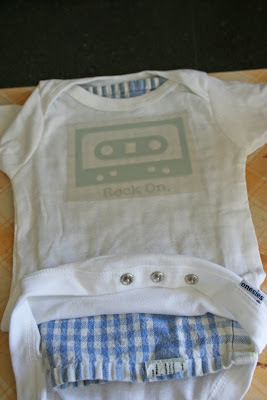 i'm actually going to make some for my boys with the rock on design. but on a dark t-shirt. i think it would have looked cute if i dyed the onesie first like a black or blue... but hind site is 20/20. you can buy these two designs in the V and Co. SHOP. and keep a look out for a few more designs coming soon! Those are really cute designs. I love them both! 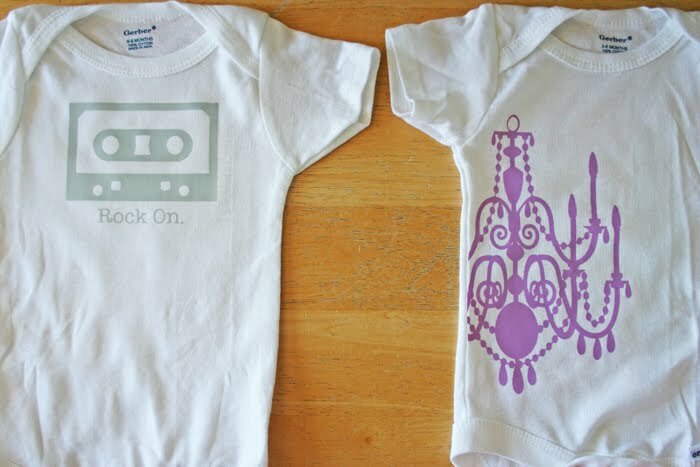 Cute onesies! Super Cute, I'm in love! What a fabulous idea! I do not have little ones any more, but pillows would be so cute! Are you doing any kind of custom vinyls? Also, would it be helpful to put something "hard" under the fabric when I iron? 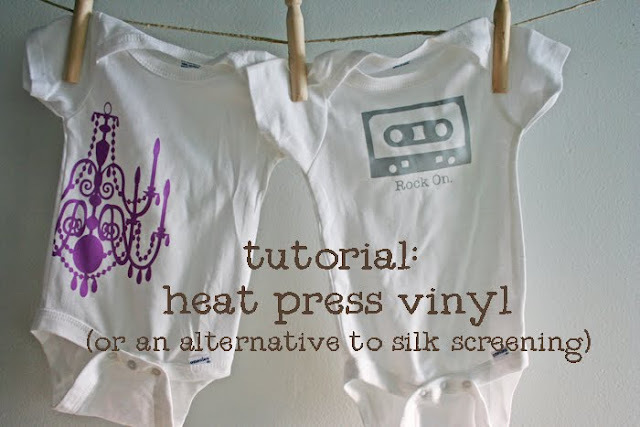 Did you create those vinyl iron-ons? They look amazing! I would love to see a tutorial on how to do that! 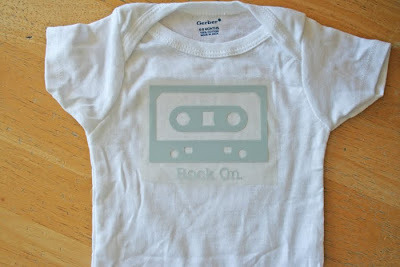 where do you get the ideas for the vinyl iron on? FYI, you can still dye the shirts with no ill side-effects to the transfer.... I love the designs! How did you create the vinyl designs? Are they the same vinyl you would put on your wall? 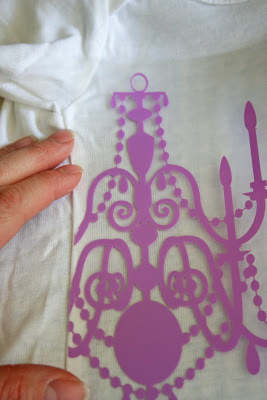 my vinyl iron ons are bought through a friend that has all the machinery to create such lovely things. i come up with what i want and then i tell her and together we come up with it. 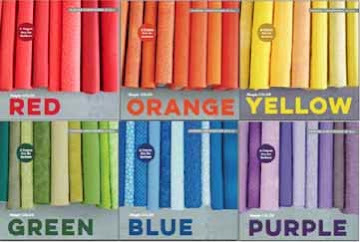 they are not the same vinyl that is used on walls. it's specifically only to be transferred onto material using heat. I love it! I have to SIL who just had/soon to have a baby! I already made the tie dye onesies! When are you headed up my way??? oh my gosh. SO COOL! Never heard/thought of that! Those are so fun...i love the designs! you are so brilliant. Daughter is of the age that all her friends are having babies. Being an artist and designer she will love this! The chandelier is so cool! i don't know what brand it is. 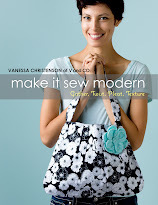 i buy it wholesale from a friend who has the machine to make the designs i ask her to do. she buys it and i buy it from her. it seems to of worked out great with the iron though!!! when i worked at a sign shop i woudl do this all the time. you have to have a heat-press vinyl, a heat press (as you couldn't use an iron), a plotter (to cut your vinyl) and basically all this hardware is no good unless you plan on making a profit from this...congrats to you! those designs are so cute btw. 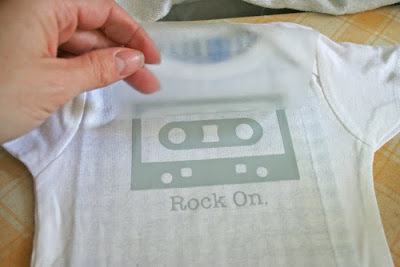 I search the internet and could not find retail heat press vinyl transfers. Anyone find a place that sells them? what a great idea. where else can i find different designs? How do they hold up to multiple washings? YOu know how those babies like to spit up LOL. 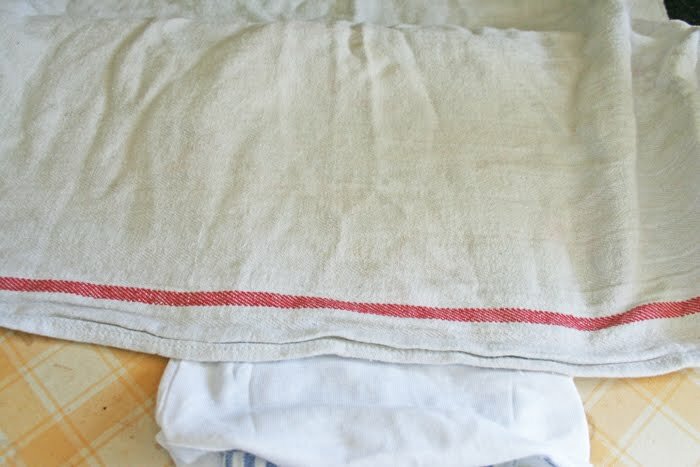 I have read a bit about it and so far it seems the people that have attempted it this way haven't had luck with it after washing once or twice...maybe the vinyl they used. We have a giant sticker / vinyl machine (like it prints up to 3 foot stickers). Now I just need to talk the hubby into getting this type of vinyl! Any suggestions on where to find it in rolls? 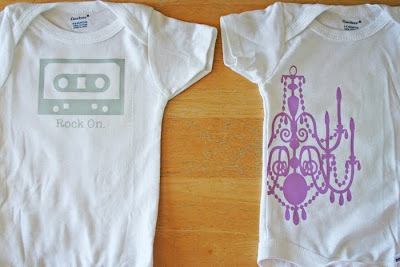 ps the onesies are ADORABLE! V... these are GREAT! I just whipped a ROCK On and Chandellier shirt for my kids this morning. Will take pics and post on my blog today to have them come order the images from you. TOO CUTE!!!! Thanks! So I bought a heat press machine so I can mass produce some onesies. Well not mass produce, but every vinyl that I found said I had to use a 500 degree heat press. haha So we splurged and bought one. We buy our vinyl from a local supplier. But you can find it on ebay. :) thanks for the inspiration! It is a really good idea to make all this shirts and it really impressed me on all this, I wonder if I could have all this to give to my son.